One of our members found this antique hand-cranked yarn spooler, but it was missing a few components to make it work. 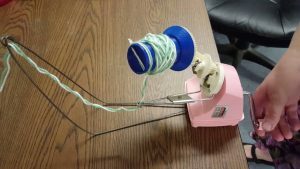 With a little bit of 3D-printing and a coat hanger, this yarn spooler is now fully functional again! This entry was posted in Makers.